Labyrinth – a pathway to encounter with God. 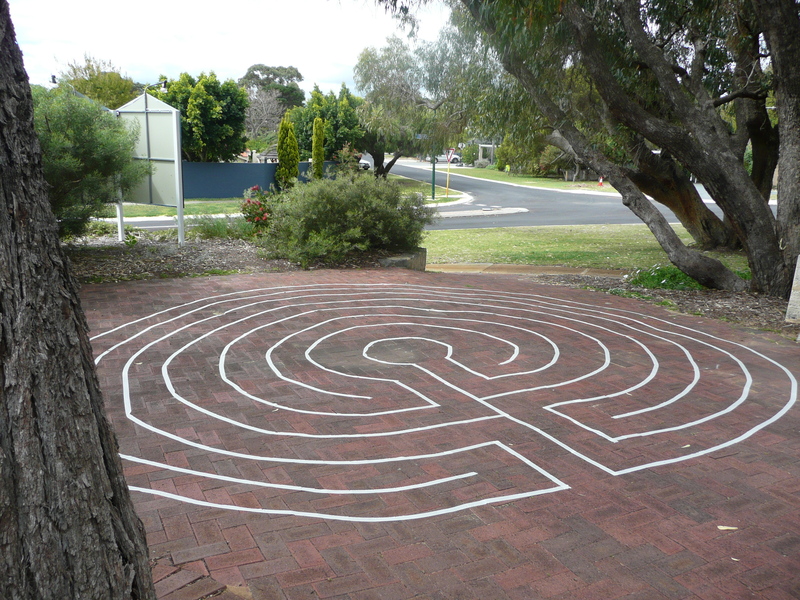 A bit slack today – installed new church PA system and laid down a labyrinth in the church forecourt. What is a labyrinth? For many it conjures images of the Minotaur of ancient Crete – half man and half bull, consuming young Greek captives left to wander in a maze of dark undergoround tunnels. While the most ancient of labyrinths can be traced to Crete, they are much more benign than that. A labyrinth comprises a simple path winding around itself to a centre – no dead ends, no nasty surprises. For many in the Christian tradition, it is symbolic of prayer – a pathway inwards, laying down cares and concerns; a meeting in communion with God at the centre; and, in retracing the pathway outwards, resolve and application. Its presence and design lends itself to silent contemplation – the prayer of no words. Simply to walk the pathway is to encounter the stillness where we can listen and hear what is needed. The labyrinth pictured is open, accessible, and kind of temporary/permanent. It’s only masking tape on pavers, but easily patchable. It’s my poor attempt to put into practice what I learned at a Robert Ferre workshop the other day. We already have a canvas labyrinth available for the use of schools and other community organisations. If you’re passing by, stop off for 20 minutes and give it a try. Great idea, and a fantastic use for that area. Might have to pop down to use it one day. It’s funny but I found your blog reading through the time change comments. I hadn’t thought of creating a labyrinth in that way but you’ve inspired me. I first discovered the power of a labyrinth at a state not-for-profit conference (a lovely place for one). Luckily we have an amazing chaplin at one of our hospitals who offers a canvas/portable one for the community. She’ll have it on the hospital campus and also allow it to be borrowed. I run a grass-roots nonprofit Women’s Resource Center and we were able to take it to a beautiful YMCA in Wilkesboro, NC. It was placed in an outdoor chapel on a hilltop overlooking a lake and surrounded by woods. thanks for the post.